The cubs pass through our camp once a day now, mostly to say `hello', we think. They had left about 9:00AM out the east trail. The day was idyllic - sunny periods, a light east wind (the wind that carries the rich smell of the east coast: a lovely mix), no bugs yet. Charlie and I decided to hike up the pass in the direction the cubs had gone. We ran into them about a 1/2 hour away. 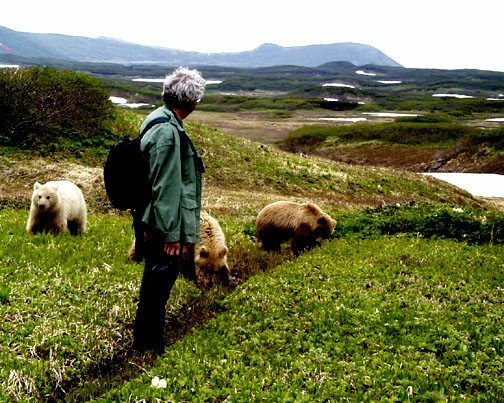 We talk to them on our approach so they will not be frightened: "Hi there little bears! I am so excited to see you" Chico and Biscuit run about and play instantly. The two wrestle 3 feet away from me, standing up. They are so tall now! On a stand up they are taller than me. It was like last year in some ways. They love to come on walks with us. But they are more independent and their behavior around strange bears is definitely not the same. Last year the fresh smell of another bear would send them flying in the opposite direction. We were walking up the bear trail which is in some places 1 foot deep, worn by the pads of many bears crossing from one drainage to another for hundreds of years. Chico and Biscuit became very excited sniffing the alders that brushed our legs. Chico chuffs. Our eyes simultaneously follow the direction her head is pointing. 75 yards up the hill to our right is a mother with three 1 year old cubs(the same age as ours). Chico instantly ran straight at the mother, chuffing as best she could at the run with Biscuit close on her heels (and of course Rosie bringing up the rear, not wanting to miss out). The mother and cubs fled up the hill, which was steep. She would stop and look as our trio ran after them and continued eventually over the top . Chico stopped periodically, making a popping sound with her jaws looking up at the family and then would gaze back at us. She has always been the leader in personality type. We couldn't figure this out. Was she hoping to play with these wild cousins? Thinking back to how she stepped between me and Podrusky (the orphan that joined our group for a while) we tentatively decided she was chasing her away. Maybe jealousy over us or protection? They were high up the mountain now and we continued up the bear trail alone. It continues to amaze me that these trails have known only the passing of bears. We came to a rub rock. 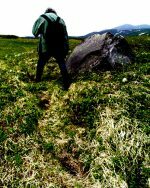 This is a rock worn smooth by hundreds of bears rubbing on it thereby leaving their scent. Normally they leave their scent on a tree but there are none up at the elevation we have now reached. (We have also observed rub sites created on the open tundra - ground worn smoothly from rubbing) They do this to let other bears know they are in the area. They appear to ritualistically step in the same place while approaching a rub site. 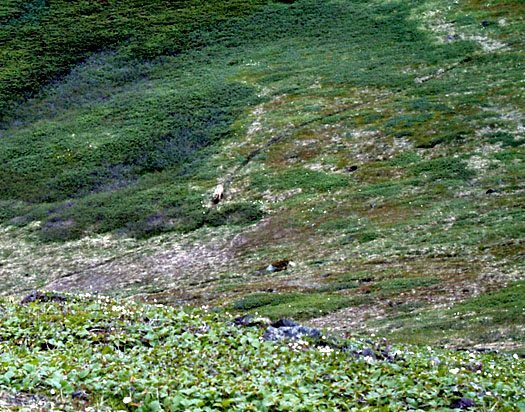 Footsteps are worn into the tundra as if carefully sculpted. I love the view to the east from the pass. No sign of man, untouched wilderness. Charlie spotted a mating pair approaching the pass from the east. We hiked about 75 yards above the trail to photograph the pair. While out of site we heard a menacing angry roar that made the hair stand up on my neck. I suggested moving up higher for this photo but Charlie thought we were in a good location. My counter assault bear spray was out of its holster, ready, just in case. The female walked along the trail alone now. It was the end of her breeding time and the roar was her chasing off the male. They come together about 1 and 1/2 weeks approximately. I am always extra alert during breeding season of the middle of May to the middle of July as I surmise emotions are running high. We have been waiting two seasons to get such a photo of a bear hiking along a bear trail!